Coburg and GAU Tutingen plates. Congrats on finding two VERY rare Coburg plates! Stephen has a great site on these badges and in the future you'll be able to tell the difference between the original and fake badges after visiting his site. Too many reasons to list on why it's a fake so if you do a search on GPBs you will see all the differences when you see an original badge. Sorry, your badge is a reproduction. It's said that the Reiter is looking towards the east for lands to conquer. Another related piece from my collection. I missed this thread so thought I would add my Reiter bust to the superb examples already posted. Thought I would share a large Horst Wessel memorial plaque made of bronze that was removed from a building from my collection. Anything Horst Wessel is very hard to find with most pieces being destroyed at the end of the war. Does anyone else have any HW items to share? Thanks guys, the medal is made of aluminum and it wasn't part of a grouping unfortunately. it's been a while since I posted here so thought I would share this interesting NP award dedicated to SA Gruppenfuhrer Kurt Guenther from Gau Thuringen that I found sitting in the back of my safe and that I forgot that I had. 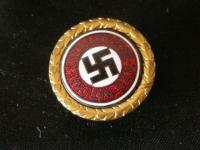 Himmler did not receive the Coburg Badge. the recipient of my BO # 626 Franz Fuchs who was with the SA Munich was also awarded the Coburg badge, GPB and the 1929 RPT badge. Came late to this thread and you're aware that these two plates are rare in the extreme. Also, as you know, I also have both in my collection. Nice Robin, here is my Reiter which is also one of my favorite pieces. Here's a rare piece and the 1st Allach presentation piece that they produced. A 1935 RPT bowl with lid. These bowls in mint condition are very hard to come by these days and I feel lucky to have one in my small collection. Nice Robin, great teller that has it all. Nice pick up! Robin, with the Nazis using the Reiter for their political purposes it's a real wonder that Allach didn't produce an example. By the way, that marble bust is a real screamer!!!! !